Inequality = Politicization of Immigration? An article by Frederick Solt (2011) shows an association between nationalism and economic inequality: more inequality prompts more nationalism (as diversion). It is conceivable that this idea can be expanded and applied to the politicization of immigration. Yes, it’s a wide shot. I use the data from the SOM project to capture the politicization of immigration. Political claims in newspapers are used as the basis, and I consider two aspects: (more claims about immigration) and polarization (positions of claims differ more), along with a compound measure. To capture economic inequality, I use the Gini coefficient provided by the World Bank (I simply assumed that standardization would not be an issue with Western European countries). 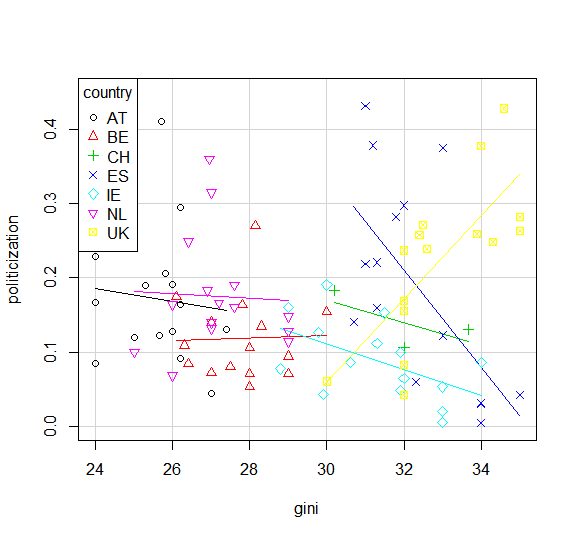 The figures (simple scatter plots is all I did) suggests there is no direct association between economic inequality and the politicization of immigration in the Western European countries examined, except perhaps in the United Kingdom. Solt, F. 2011. Diversionary Nationalism: Economic Inequality and the Formation of National Pride. The Journal of Politics 73 (3): 821–830. doi:10.1017/S002238161100048X.